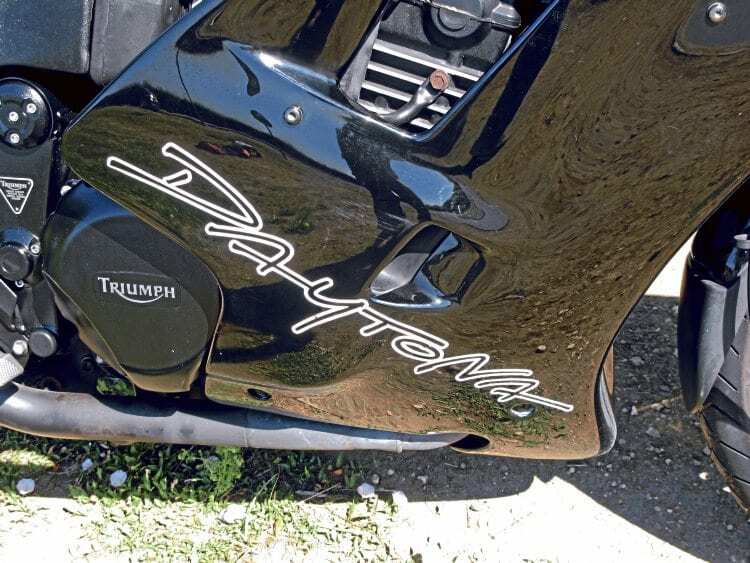 When it comes to bikes, few tales are more heartening than the revival of the Triumph brand. An opportunity to sample one of the bikes that aided the triumphant rebirth of the famous Brit brand was one I couldn’t overlook. Actually the ride on a much-acclaimed 1995 Daytona 900 was more of a demand really. Owner Ian Wilson knew when I barked at him excitedly and with more than a hint of pressure, ‘gizza go on that man!’, he was advised to give me the key. After all, I’m a mate, and mates have to be kept happy right? To be honest, I was slightly more diplomatic that that. But when I caught sight of the black beauty parked up and looking slightly unloved in the corner of his workshop, nostalgia took charge. Desire to have a go on the triple became more of a need. Beefy, big and British. Just like Mick McManus. 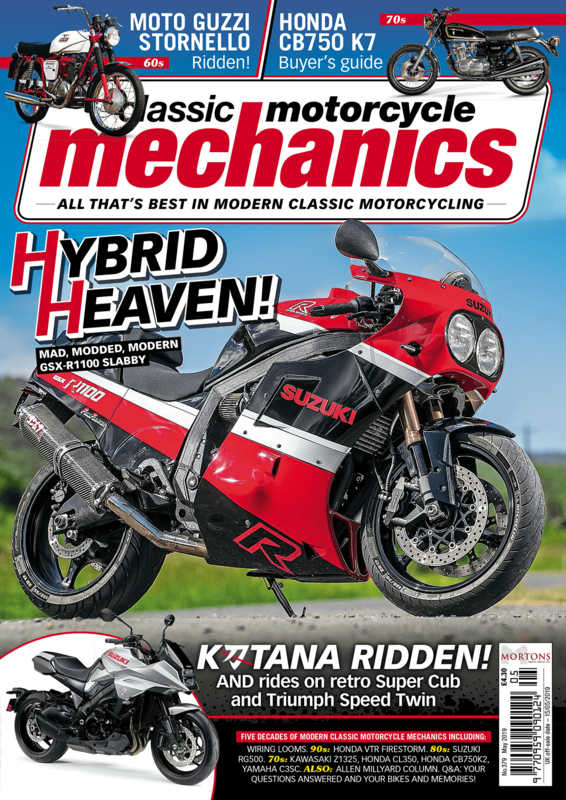 I well remember being wowed by the first sight of the Hinckley-built bikes on the front covers of bike mags back in 1991. When further inspired by the test rides all being super positive, it didn’t take long before I felt I had to have one. I plumped for a Trophy 1200 in the end and enjoyed many hours on it – several days each week in fact. Workings days that is. Eight years of London dispatching had me tired and weary of riding the sheds (CX500s in the main) I’d used so far. The idea of converting to a nicer seat on which to toil seemed like a much better plan. In the end it wasn’t, but that’s another story. White-faced clocks hint at a sporty bent. 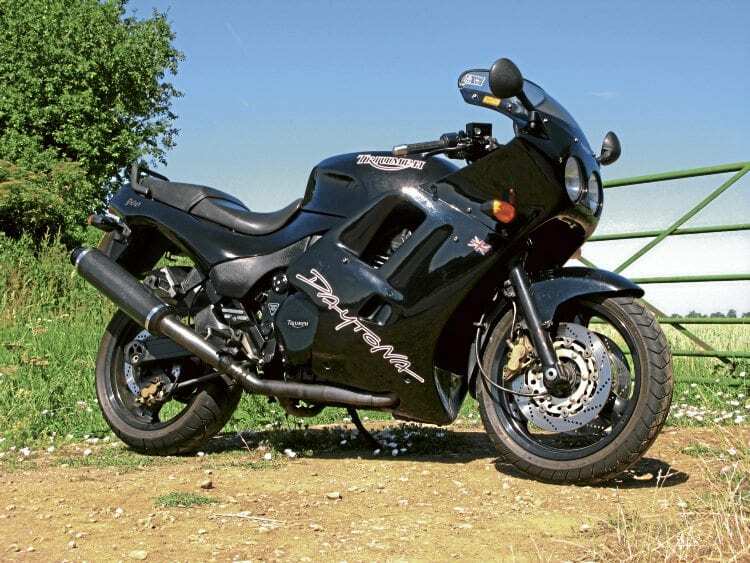 Three years after that 1992 purchase, I took up the pen to scribble about bikes, and since then I’ve had a go on just about all the stuff made up there on the A5. But thinking on, the 900 Daytona is a model that’s somehow escaped my attention, elevating my curiosity to try it still further. Much turned out to feel familiar and endearing, especially the memories it evoked. Bags of protection from this fairing. Checking it ran, and ran sweetly, proved successful with the lovely three cylinder soundtrack whetting the appetite to get on board ASAP. The distinctive tones from the twin pipes took my mind and ears back to another Trumpet that had my name in its logbook back in 1979. My T160 Trident probably wasn’t the most suitable bike for that mechanically deficient period in my life. It did keep me generally happy, but lots of frustrating unscheduled roadside stops culminating in one final clatter to a halt with a busted rod saying hello to the world, put an end to that particular relationship. 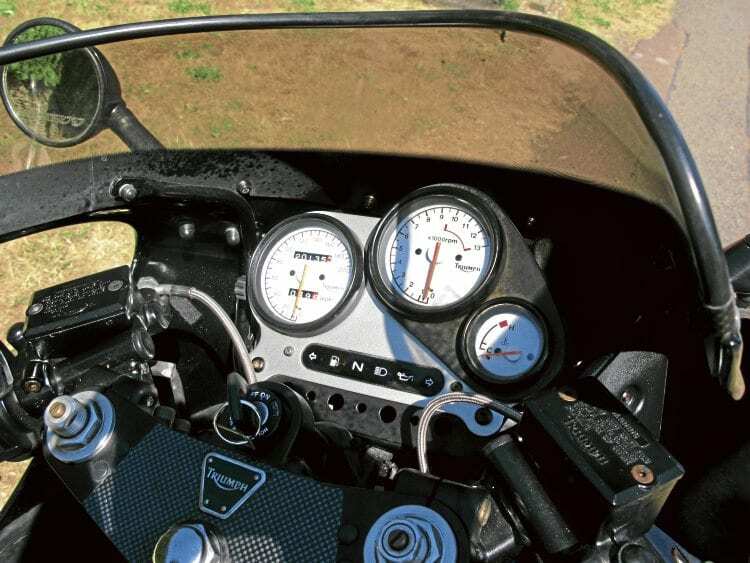 The reliability issues highlighted one of the key differences between Meriden and Hinckley creations – ability to arrive at B after setting off from A. I felt confident my afternoon of whizzing round on the Daytona would be a lot less mechanically risky than it would have been on the Trident. And so it was to prove. It’s a weighty old bugger the 900 mind, requiring a bit of a heave to haul it up from its sidestand. 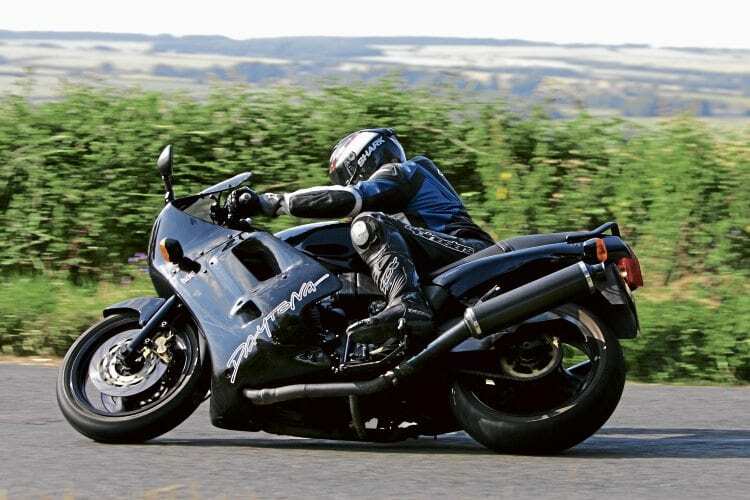 Once it’s upright there’s still a top-heavy feel, making the bike a tad ponderous at a slower pace. But get its three-spokers spinning quicker and the Daytona lightens up to feel more manageable and admirable. Typically neutral steering is a bonus that helps its handling, letting you plot and track accurate lines through corners. Though when my confidence was boosted further and I started going faster, especially when trying to make myself look good for the man with the lens, weight-related limitations returned. Not much in the way of under-seat storage. A certain amount of forward planning and anticipation is wise to ensure all goes as you’d prefer when trying to get a shift on. 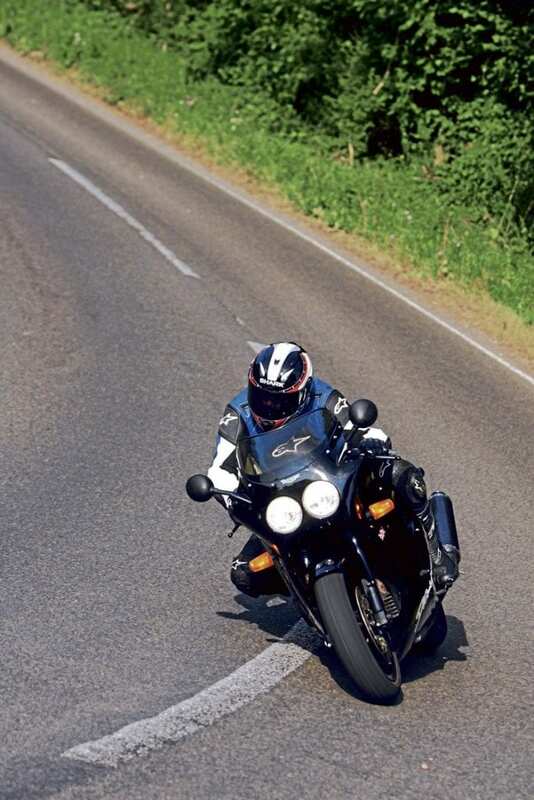 The Triumph’s weighty momentum means a bit of brawn’s needed to deflect it through corners at speed. And though I’m not saying you need a gym membership, a healthy bit of bicep flexing is a prerequisite to rapid navigation. Last second changes of plan aren’t tolerated too well by the Brit bike. A slightly mushy sensation from the suspension also reminds you to keep it in your pants and get things right in advance. Thankfully the Nissin four-potters are well able to haul up the metal to help alter the pace should you mess up. Famous name re-born for the 1990s. 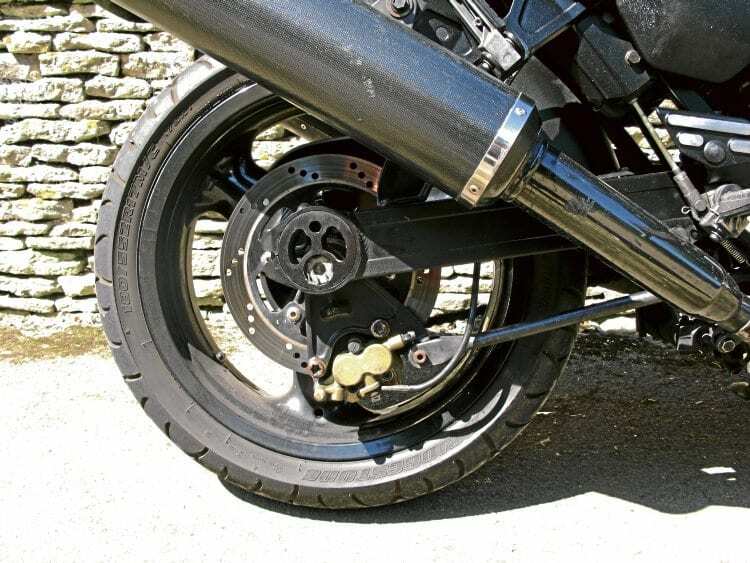 The handling challenge is all as much a fault of the engine as it is the bike’s weight really. The triple is such a joy to use, you easily end up getting into that upper performance zone that starts to test the chassis that bit more. Ironically, you don’t actually have to ride the Daytona faster. In fact the flexibility of the motor is geared perfectly to more relaxed and gentle running that needs less revs and gearchanges. It’s just that it sounds so bloody lovely when it’s spun up harder, it’s hard to resist sending the rev counter and speedo needles further round their dials. Luckily, with greater familiarity and the passage of miles, the Daytona’s bulk won’t seem quite so bothersome. Armed with your new-found knowledge and technique, piloting the 900 more quickly doesn’t seem the challenge it was to begin with. That’s not strictly true of course as you can’t change the laws of physics. But as with all things you grow to love, you tend to forgive and forget any shortcomings. I certainly ended up feeling positive enough about the Triumph not to dwell on anything less than perfect, and just couldn’t help falling for the bike. The classic style, the super sound, the sheer Britishness and part it played in helping to get John Bloor’s dream on the road, just can’t be ignored. Neither can its relative comfort and 200 mile tank range which gives it extra versatility. As owner Ian is selling the Daytona, and given that he’s only asking around £2000 for it, I have to admit I was tempted to hand over some readies to extend the riding pleasure. It’s a hell of a lot of bike for that sort of money. In fact, just let me go and do some maths. Maybe my third, and arguably what would be my best period of Triumph ownership isn’t that far off. “We don’t see many Daytona 900s these days. They’re a cracking bike, a good-looking classic. Owners generally want to hold on to them. Triumph is a trendy, sought after brand at the moment. 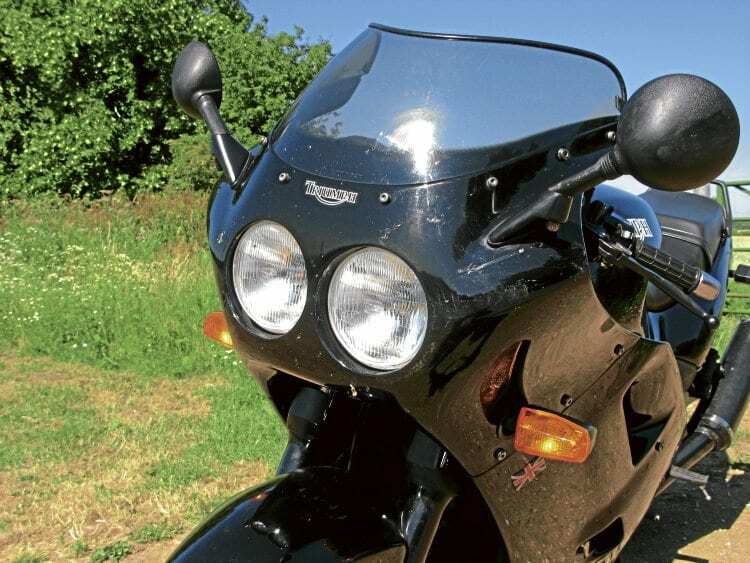 “Daytonas are either well-looked after with low mileage, or have been round the world and look really ratty. They don’t age well if they’re not cared for. Fittings and fasteners corrode, and paintwork soon looks rough. 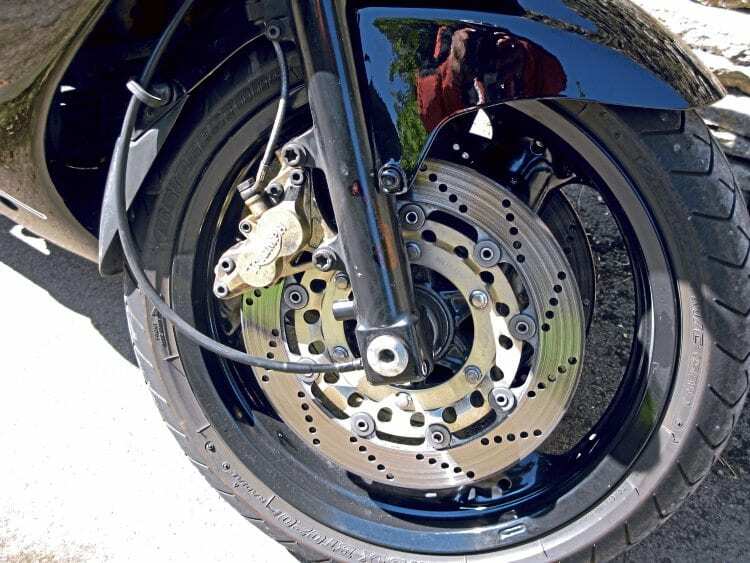 “The most important thing to check is the sprag starter clutch. 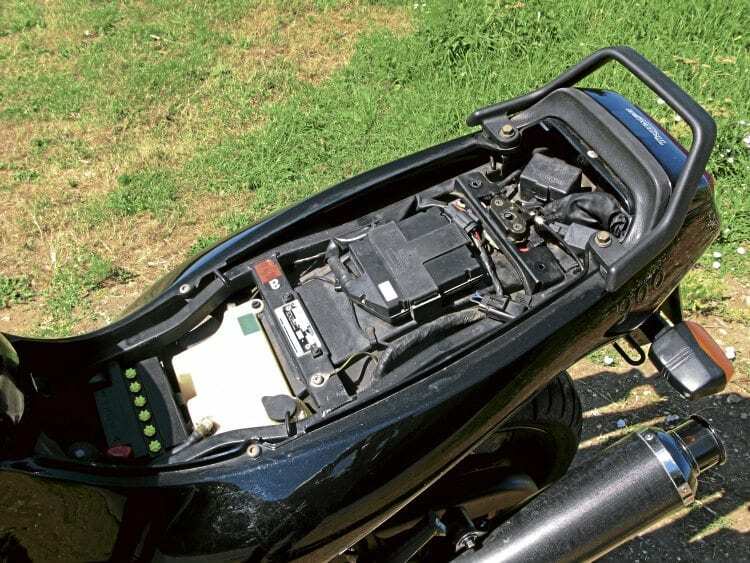 Ideally check it when the motor’s hot to see if it bites and turns the motor over. If it slips, then it can be very costly to sort. 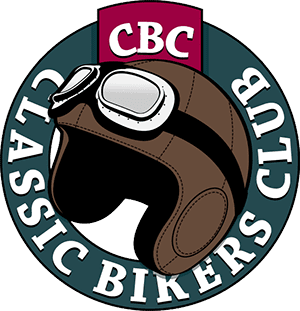 We can fix the early bikes for around £500-600. You can get at the clutch fairly easily, though you do have to grind the crankcase to fix the uprated part. Later models (like our test bike) need to have the engine out. We would charge around £1500-1600 to do that job. You could of course go to a non-franchised dealer to lessen the bill, or do it yourself. Bits cost around £250-300. “It’s pot luck as to when it goes. Some only last 20,000 miles, others can go for more than double that. The upgraded clutch doesn’t fail, so if the job’s been done you’re laughing.